Phenolic motifs are ubiquitous in natural products, dyes, insecticides, medicines, and materials. They also represent an ideal resource for chemical science to forge new connections, because they are commercially available at low cost, readily synthesized from bulk materials, and potentially derived from phytochemicals of vascular plants. However, the chemoselective and positional selective functionalization of phenols constitutes a challenge for synthetic chemistry. Although interest in selective modification of phenols began in the 19th century, and numerous methods have been developed, most of these classic methods suffered from lack of selectivity, a mixture of byproducts, extra purification efforts, as well as the involvement of harsh conditions and toxic reagents in some cases. Recently, Wang Group from Shanghai Institute of Organic Chemistry of the Chinese Academy of Sciences has successfully developed a Cu(II)-Catalyzed ortho-Selective Aminomethylation of Phenols in JACS . This catalytic system showed exclusive ortho-selectivity for the free phenols when coupling with potassium aminomethyltrifluoroborates. The products was afforded in high yields under mild conditions (eg: 80oC, weak base, open flask). Variety of functional groups were tolerated. 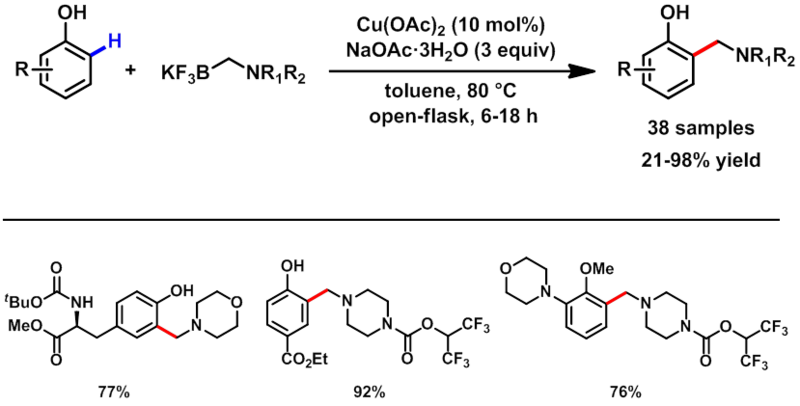 This method was further demonstrated in the convenient synthesis of biologically active small molecules and modification of natural amino acids. The unique ortho-positional selectivity for phenols may provide a method of choice in many cases due to its simplicity and broad application. This work was financially supported by the National Key R&D Program of China, the Strategic Priority Research Program of the Chinese Academy of Sciences, and the “Thousand Recruitment Program for Young Professionals”.